Silver pillars are beautiful with other silver accents. It is no surprise that this color is a favorite for minimalist designs, and when combined with the elegance of candles, silver creates a unique look for any decorative scheme. Weddings: Silver candles are perfect for formal centerpieces or church decorations, and a carved silver pillar candle can serve as a unique and stunning unity candle during the wedding ceremony. For couples celebrating their twenty-fifth wedding anniversary, silver is a traditional color choice. Churches: Churches with cool stone fixtures and gray accents can add a spark with silver candles at the entry, altar, in windows, or for use during special ceremonies and events such as baptisms, memorials, holiday masses, or weddings. 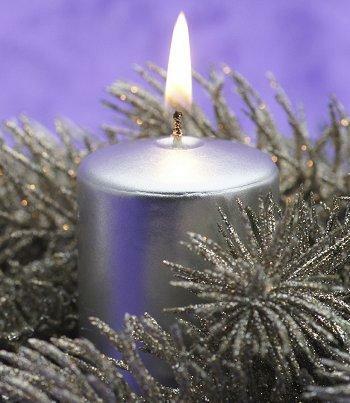 Holidays: The rich sheen of metallic candles is an excellent choice for holiday decorations, and silver is a traditional choice during Hanukkah. Silver candles are also popular in Christmas candle centerpieces or when paired with other holiday and winter colors such as red, green, or blue. Modern Décor: Silver is a popular choice for minimalist modern interior design, particularly when used as an accent color with black and white color schemes. Silver candles can be used for everyday decorative accents or chosen for special events such as a formal dinner party or New Year's Eve party. Gifts: Silver candles can be a perfect gift for a newlywed couple or a couple celebrating their twenty-fifth anniversary. They also make great housewarming gifts or holiday gifts for anyone who enjoys candles. No matter what the occasion, there are several ways to use silver metallic candles in stunning decorations. Choose a textured candle for a unique look. 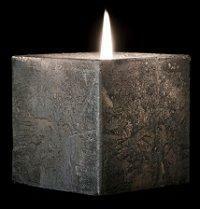 Create a fast, minimalist centerpiece by grouping several silver pillar candles together on a mirror. For more elegance, use pillars of different heights and sprinkle clear or colored decorating stones at the base of the arrangement. Combine silver candles with other cool colors such as aqua, teal, blue, green, turquoise, or purple for a more colorful but no less elegant arrangement. If you only want to use silver candles, use other cool colors for accent gems or stones at the candles' base. Instead of plain candles, opt for designs with glittery silver textures or silver accents on white candles, such as dots, snowflakes, swirls, or other abstract patterns. Add a simple candle ring with additional silver accents, or choose a beaded or glass candle ring or holder to complement the candle's metallic sheen. Place a single silver pillar candle in a tall hurricane glass and add beads, faux gems, or decorating stones to fill the base of the glass. 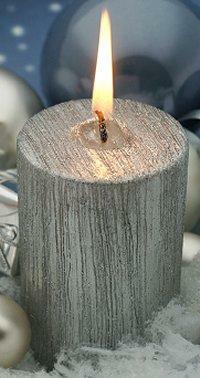 Use a thick, plain black pillar candle holder for a single silver pillar candle to make an elegant, stunning accent. When putting together centerpieces or other decorations using metallic silver candles, take care: the finish on the candles can scratch easily, so gentle handling is imperative. The cost of silver metallic pillars can range from $5 to $25 depending on the size (both width and height) of the candles, the type of wax, and the type of silver finish. Unique pillar shapes are striking. If you can't find the right silver metallic pillar candles for your decorating dreams, consider a different type of silver candle or select a silver candle holder or tray to add that luxurious metallic sheen to any candle color. Whether you like the beautiful glitter of silver or the elegant weight of the candles, silver pillars can be added to any candle arrangement to create the pefect accent for any special occasion.